Looking for funny note cards to keep on hand all year round? This sassy set of 8 different cards is exactly what you need for all those special occasions throughout the year! 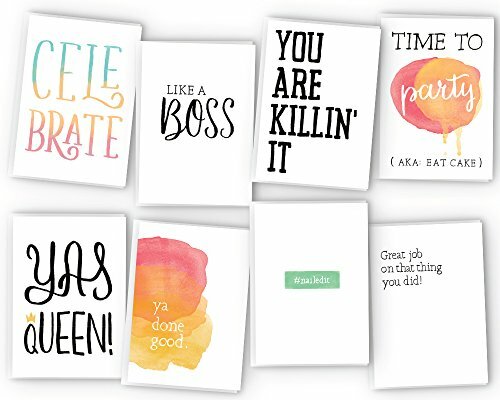 Featuring 8 different designs that can be used as birthday cards, graduation cards, baby congratulation cards, and encouragement cards, this set of 48 cards and envelopes is perfect for when you want to be a little sarcastic while still being very thoughtful. Do business with people who care and truly put their customers and our world first! These greeting cards are printed on high quality, heavy weight, white cardstock. Our cards and accompanying envelopes are made RECYCLED materials, and all of our packaging is made from 100% BIODEGRADABLE materials. Not only are our products high quality and eco-friendly, but 10% of all proceeds from your purchase are donated to charities and organizations around the world. These cards are the "standard thank you card" size, measuring 4.875" x 3.375" when folded and 4.875" x 6.75" when unfolded. Envelopes are the standard A1 size with a square flap, made from 28lb bond paper, and is gummed for sealing. USPS standard postage rate applies, making these cards perfect for mailing to family and friends. These cards are completely blank inside, leaving you plenty of room for your own personal message!